44 Species – 16 Lifers – Monteverde BIRDS! Emerald Toucanet with an attitude! The featured photo at top is of a Wilson’s Warbler. And I am now working on the other parts of my trip gallery like other wildlife, the hotel, flowers, etc. which will go much faster than my huge collection of bird photos! 🙂 It’s at 2019 April 7-13 — Monteverde, Costa Rica which the birds gallery is just one part of. I am thankful that when the Quakers came from the states and founded the little mountain farming town of Monteverde they also had the foresight to start preserving the virgin forest around the town and that other ecologists came and continued the effort with some of the largest forest reserves in the world! Nature is the main attraction of Monteverde! Three-wattled Bellbird close to the ground in search of food – A 1st for me! Just a few sample shots of the beautiful cloud forests of Monteverde, Costa Rica which I’m sorry I did not pay more attention to in my photography this past week. Every tree is a beautiful work of art and some are old growth or a part of an ancient virgin forest. I was particularly surprised to see how close we were to Arenal Volcano and what a beautiful view we had from the continental divide in Santa Elena Reserve shown above in the feature photo. I plan to go back to Arenal in November! So many beautiful places of nature here! I just realized that I have started to repeat some photos, so this will be all of my reports on a wonderful week in Monteverde. My “Trip Gallery” will be coming to my online photo gallery soon at 2019 April 7-13 — Monteverde Lodge & Gardens – just need a few more days for that and then “The Book,” my first on Monteverde even though I was there one other time. Watch my Bookstore for the Monteverde photo book! This trip alone yielded photos of 44 species of birds! And check out some of my other trips in the Costa Rica Trips Photo Gallery! Almost every location is as beautiful and exciting as this one. I go for birds and show mostly bird photos, but I love the other animals too and here is my collection from all four reserves and the lodge. Enjoy! I saw one really cool and new-to-me moth at Santa Elena Reserve, two butterflies at Selvatura Park and all the rest were at Monteverde Lodge & Gardens where they have a really nice small butterfly garden indoors. There is one dining table for up to 4 people that can be scheduled for a private Butterfly Dinner! 🙂 Kind of neat! And two of the moths I photographed on my little private room terrace/patio. Selvatura claims to have the largest butterfly garden in Central America and the huge dome looks like it but this trip it was horrible with only two (2) species of butterflies. There is a Monteverde Butterfly Garden operated by a couple of nature lovers but I did not go this time. Three years ago it was great! There were a lot of butterflies, especially blue morpho, flying around in all four reserves, but difficult to photograph there. See also my Butterflies & Moths Gallery – a growing collection! Selvatura Park is (or was) a great combination Nature Park next door to the Santa Elena Cloud Forest Reserve AND an Adventure Park (which part is now taking over). It was a super place when I visited 3 years ago with the biggest and most impressive Butterfly Garden I had ever seen and they claimed it to be the largest in Central America. Well this time the butterfly garden had only two species of butterflies – my hotel has more in their tiny butterfly garden! Their Hummingbird Garden is flowers & feeders attracting wild hummingbirds, so what seemed like fewer this year may just be what is happening in the wild (or what they are feeding them and fewer butterfly-attracting plants). I refused to pay extra for the serpentarium or insect exhibit, expecting they had gone down like the butterfly garden. The hanging bridges seemed to be about the same and like before I saw one Bellbird and one Quetzal. So they are more about the forest than birds and I enjoyed the bridges the most, but I do not recommend spending the high amusement park prices if you just want a nature visit. The adventure business of zip lines, tram ride, a new “Superman” zip and other such has taken over here. 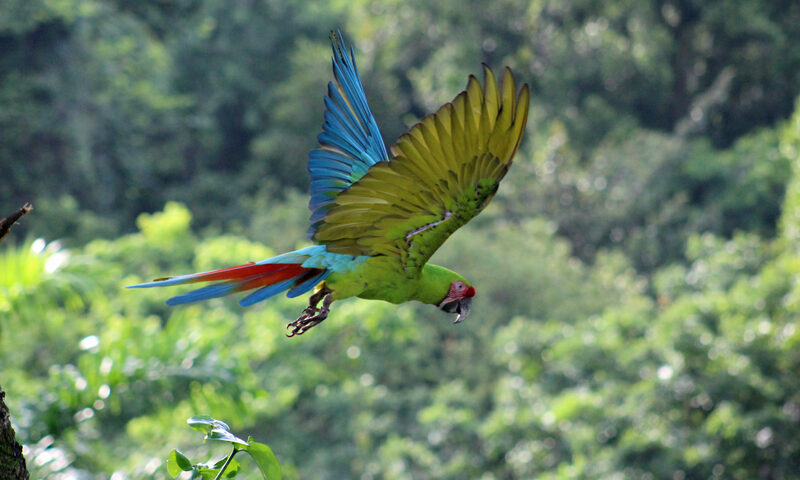 For nature lovers and birders I recommend sticking with the four nature reserves in Monteverde. Here’s 4 slide shows of what I saw there which was still nice as I hope the photos show. A day late because I had so many photos and so little time yesterday. Curi-Cancha Reserve is probably my favorite reserve in Monteverde, not only because I photographed more birds there but because I think it is the most beautiful and I apologize for no scenery photos except this one unusual tree below. I use my cell phone for scenery shots and had let Rodiber, my guide, carry my phone because he gets great bird shots on it for me through his high-powered scope. In 1970 the Lowther family purchased the property of Hubert and Mildred Mendenhall and named it Curi-Cancha, the name derived from “Golden Enclosure” in Inca. At that time the property was approximately 1/2 pasture and 1/2 virgin rainforest. In the ensuing 45 years the Lowthers cleared no areas and allowed the majority of the pastured areas to re-grow into forest. It was another great morning with the same super guide at a different Cloud Forest Reserve. The Monteverde Cloud Forest Biological Preserve of the Tropical Science Center is the first private area for the conservation of wildlife founded in Costa Rica in October of 1972. We did a lot of walking with a lot of hills but it paid off with more birds today and two that birders all over the world come here hoping to get: The Resplendent Quetzal and the Three-wattled Bellbird. Below are my photos of some birds we saw and as always I see more than I get photos of. I’m not sure yet, but 3 or more lifers today! One bird is still unidentified. Hear how the birds, on every blooming spray, With joyous music wake the dawning day. My first of 6 different Cloud Forest Reserves this week (where trees, wildlife, water and air is protected) was this morning at Santa Elena Cloud Forest Reserve (right click on page for English translation). It is beautiful and less crowded than the one I will visit tomorrow. The above featured cell phone photo is from the highest point in the reserve looking East/Northeast at Arenal Volcano which I visited last year at Arenal Observatory and going again in November. The photo at bottom is looking the other direction at the mountains and clouds you are above in a Cloud Forest. Cool birds huh? Most live only in the cloud forest. Other wildlife will be a separate post for the whole week.